Stuffed grape leaves also known as dolmas have a long culinary history across the Middle East as well as in Greece and Turkey. Fillings and spices vary by culture but basically the same techniques are used to make them; grape leaves are wrapped around a rice-based filling that includes some combination of meat herbs spices and sometimes nuts and dried fruits. I discovered this amazing appetizer recipe and had to share it with you. 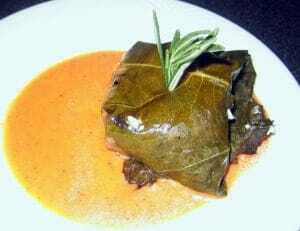 Have you ever had a grape leaf wrapped around goat cheese atop a divine tomato vinaigrette? Delicious! You must make these appetizers your guests will love them! You can use fresh or bottled grape leaves. To use fresh ones select young whole medium leaves from the grape vines. Using scissors cut off the stems and either soak in very hot water for 15 minutes to soften or blanch grape leaves until they are soft. Fresh grape leaves can be washed and frozen between layers of waxed paper and will keep for a year. To use bottled grape leaves rinse well under cold water to remove the brine. Place them in a colander (back side up) to drain and hold until ready to use. Don’t throw away any torn or damaged leaves as they can be used to patch holes in other leaves. If you don’t have access to fresh grape leaves you can find bottled or canned grape leaves at Middle Eastern grocery stores or online. Portion cheese into two ounce balls. Lay leaves out on counter. Place one cheese ball in the middle of each grape leaf. Season cheese with salt, pepper and fresh herbs. Drizzle with a little olive oil. Wrap leaves around the cheese and skewer with toothpicks or skewers. Refrigerate at least one hour. Heat grill to low heat. Place grape leaf package on grill seam side up. Cook till cheese is just soft and the leaf is just charred. Place on plate. Remove skewers and drizzle with roasted tomato vinaigrette. Char tomatoes in hot saute pan. Add shallots and saute until soft. In blender, puree tomatoes with vinegar, honey, spices, salt and pepper. Drizzle in oil with the motor running. If you love the traditional grape leaf dolmas, why not try a different take on them and give this grilled grape leaf wrapped goat cheese appetizer a try? You won’t be disappointed! ENJOY! For more ideas like this, check out How to Cook Gourmet by Kathy Davault. She is a professionally trained chef and loves teaching others how to cook like the professionals without having to spend the money to go to an exclusive culinary school. She has been enjoying teaching and cooking for over 30 years. She shares her tricks, tips and how to’s for you become the gourmet chef you always wanted to be. Are You Cutting Years Off Your Child’s Lifespan? I’ve never tried grape leaf before, but I do love goat cheese! Wow, I haven’t had grape leaves since I was a kid – my best friend’s family used to eat those in various dishes. Yum. Sounds good i’ll have to give this a try.